The ICA’s invitation-only event brings together industry leaders across the Nine Foundational Pillars of new cannabis markets, to share lessons learned and best practices with regional government officials and stakeholders. Africa’s legal cannabis industry could be worth more than $US 7.1 billion annually by 2023 if legislation is introduced in a number of the continent’s major markets, European-based market intelligence and strategic consultancy firm Prohibition Partners has found in its latest report, released today. The African Cannabis Report™, published today, finds that countries across the continent could generate significant economic benefits through the development of legal cannabis markets. Government has suspended the licensing and growing of marijuana — popularly known as mbanje. 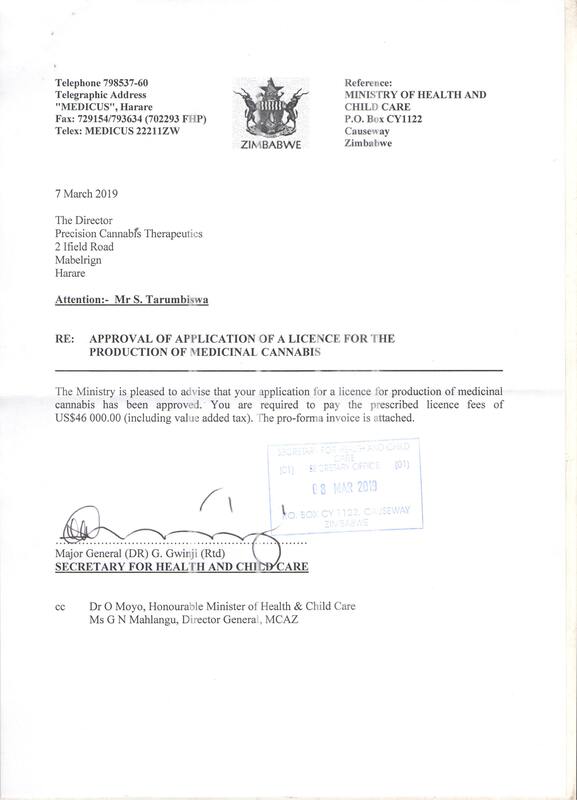 Last month, President Emmerson Mnangagwa’s administration gazetted licence fees for those interested in growing cannabis (mbanje) for research and medicinal purposes. This was seen as part of strategies to shore up revenue flows to the depressed fiscus. The development, which had divided opinion in the hugely polarised southern African nation, had made Zimbabwe the second country in Africa to legalise cultivation of the plant after the tiny kingdom of Lesotho announced the continent’s first licence to grow cannabis legally last year. Until now, it had been illegal to grow, possess or use cannabis in Zimbabwe, with offenders facing up to 12 years in jail. The Zimbabwean government this week published a licensing regime that will allow the legal cultivation of cannabis, state-owned newspaper The Herald reported on Saturday. Growing mbanje, as dagga is commonly known in Zim, will be legal for research and medical use under the new regulations, Statutory Instrument 62 of 2018, "Dangerous Drugs – Production of Cannabis for Medicinal and Scientific Use Regulations". Zimbabwe has been considering such partial legalisation for the last eight months. Zimbabwe is considering legalising the production of cannabis for medical purposes to lure investors keen to grow the drug, a cabinet minister says. Investment Promotion Minister Obert Mpofu says a Canadian firm has applied to the government for a permit to produce the drug, known locally as mbanje, in one of the country's soon-to-be-set-up Special Economic Zones (SEZs). "We have received numerous inquiries from investors who want to participate in the SEZs and one of them is a big international company that wants to be involved in the production of cannabis," Mpofu was quoted as saying by the state-run Sunday News. THERE was a small amount of marijuana in Zanele Moyo’s room and not the huge cache of empty alcohol bottles initially indicated, higher education minister Jonathan Moyo said on Wednesday. Zanele, Minister Moyo’s daughter, was found dead in her off-campus flat in South Africa last Saturday. The 20-year-old was a second year student at the University of Cape Town. Her body arrived in Harare Wednesday ahead of burial at Glen Forest on Friday. Addressing mourners who included President Robert Mugabe, Minister Moyo said they found a small amount of marijuana when they got into Zanele’s apartment. According to The Herald newspaper, Minister Moyo said the family had not raised any suspicion of foul play over his daughter’s passing. A 19 year old local tout on Monday left the court in stitches when he said he smoked dagga as a way of enjoying himself. Tulani Madondo of Mtapa suburb was apprehended by police on patrol while smoking a twist of the drug at a corner near N. Richards wholesale. "I just smoked mbanje (cannabis) as a way of enjoying myself your worship," Madondo told the court. Magistrate, Judith Taruvinga convicted Madondo for contravening provisions of the Dangerous Drugs Act before finning him $50. If he fails to pay the sum he will spend 20 days behind bars. In coming up with the sentence Taruvinga considered that Madondo was a first offender but warned him to desist from enjoying activities with criminal implications.